Richardson Housing Group (RHG Homes) is pleased to announced exciting incentives just in time for the 4th of July! 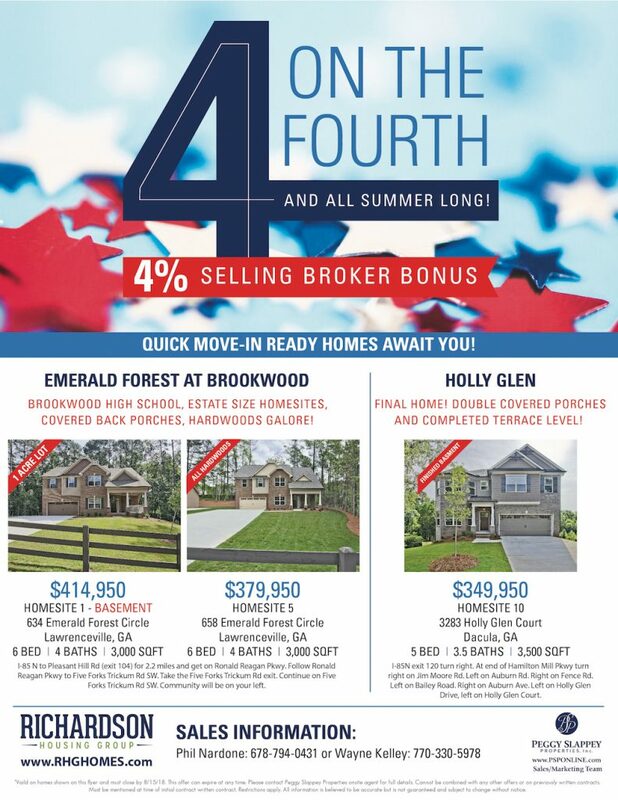 This Independence Day, and all summer long, agents will receive a 4 percent selling broker bonus on select move-in ready homes by RHG! Check out these quick move-in ready homes that are available for purchase now! Emerald Forest at Brookwood offers beautiful new homes in Lawrenceville, in the sought-after Brookwood High School district! You’ll love the estate-sized homesites and custom features throughout each home! 6 bedrooms and 4 baths on a full basement – 1 acre lot! Open-concept layout includes gourmet white kitchen with granite countertops, subway tile backsplash and large island open to a spacious family room with stacked stone fireplace and cedar mantle. Hardwoods on the main level, and heavy trim and custom features throughout. Covered front and back porches with a gas grill connection are the perfect spots for entertaining! 6 bedrooms and 4 baths with hardwoods floors throughout! Open-concept layout includes gourmet white kitchen with granite countertops, subway tile backsplash and large island open to a spacious family room with stacked stone fireplace and cedar mantle. Hardwoods floor throughout – no carpet in this home! Heavy trim and custom features throughout. Covered front and back porches with a gas grill connection are the perfect spots for entertaining! Holly Glen offers beautiful new homes in Dacula! This is the final home available in this incredible community! 5 bedrooms and 4 baths on a full basement – 1 acre lot!